You’re both excited and panicked. Friends coming for dinner tonight. You have a million things to get done but you want to make a meal that your company will love. Everyone has been crazy lately so you know comfort food needs to be on the menu. These Beef and Sweet potato noodles recipe will be the star of your dinner party…. the best part? It will look like you’ve cooked all day but its a meal that’s not super labor intensive! 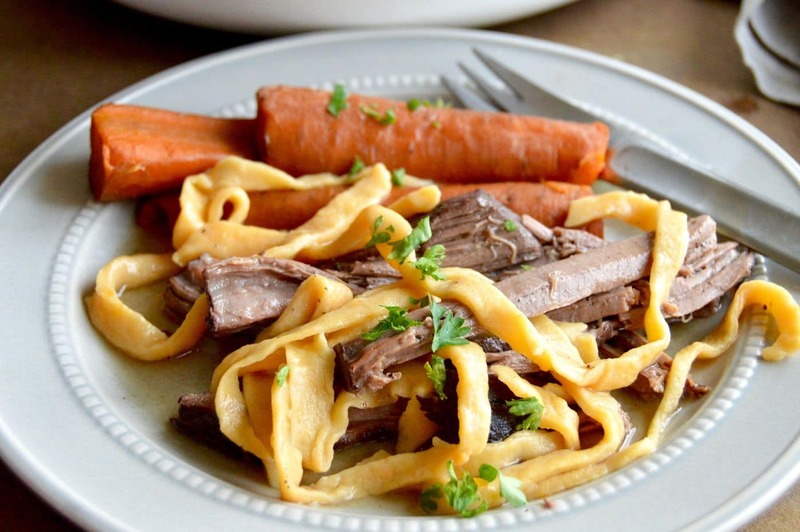 These Beef and Sweet Potato Noodles are a sure way to satisfying anyone you cook for. The recipe is a slightly tweaked version of my Grandmother’s recipe she made all of the time when I was growing up. Whenever we would get to her house you could smell the beef simmering on the stovetop and the noodles would be drying on the counter. I’m sure she must have made double the amount of noodles because my brother and I would sneak some ( a LOT of them) before they were cooked. It’s that crazy time of year with the holidays coming up at full speed ahead combined with all of the end of year activities that keep you moving. 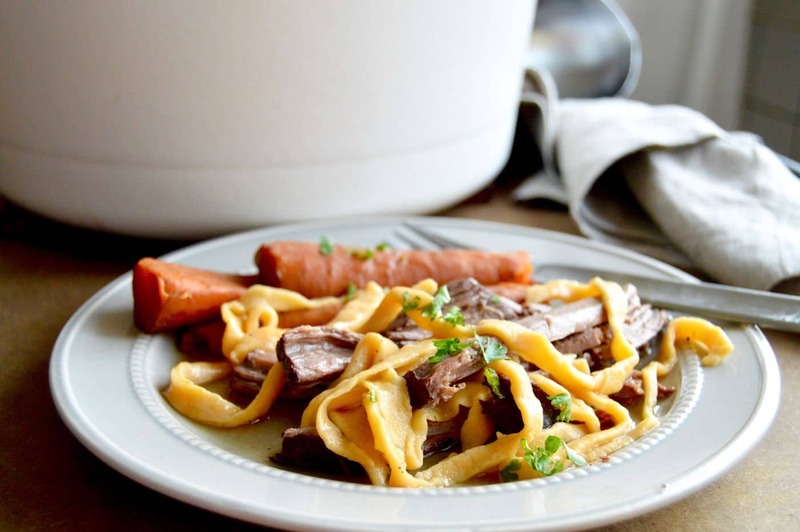 This recipe for Beef and Sweet Potato noodles is a tried and true recipe you can count on when you are having company over that will be a crowd favorite every time you make it. There is something very comforting about this Beef and Sweet Potato Noodles that has meat that literally falls apart it’s so tender. It’s surrounded by homemade sweet potato noodles that absorb the some of the sauce while maintaining a firmer texture. 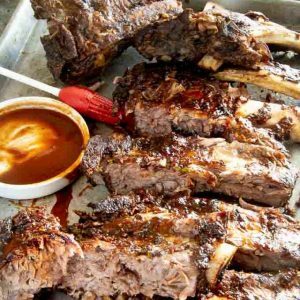 The sauce is velvety smooth and packed full of flavors from letting it simmer for a few hours to both reduce the liquid and intensify the flavors. The sweet potatoes don’t change the wonderful texture of the noodles which is al dente once you cook them. One bite of the noodles and you can just tell that they are homemade. They’re super tender and a pure pleasure when taking a bite. I promise you, that bite of homemade noodles will make anyone you make them for extremely happy. Don’t panic, I know just reading the words homemade noodles just sent some of you into full blown panic. These noodles are easy and not hard to make at all. They don’t require any special equipment and I promise they are worth the little bit of extra effort! Easy/Hard: Medium. This recipe for Beef and Sweet Potato Noodles takes a little extra time to make the noodles, but most of the time needed for this recipe is for the meat simmering and breaking down to fork tender goodness. The noodles are as easy as mixing together and rolling them out to dry. 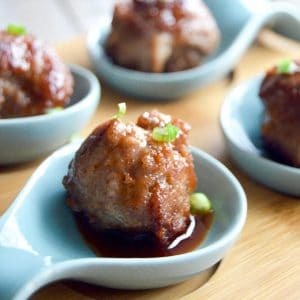 Cocktail Pairing: I would serve this dish with a red wine. Right now my favorites are any Granacha wines but the beef in this dish is hearty enough you could also go with a cabernet or any substantial red wine. Make Ahead? This dish could be made ahead partially. You could prepare the beef overnight in a crock pot, or make it a day or two in advance and just rewarm it. You need to make the noodles on the day you are serving them. Both the mixing of the noodles up from scratch and boiling them right before serving. While you can eat the leftovers if there are any, the noodles are better if made right before eating them! If you love comfort foods like this you may also like my Ham and Potato Supreme Recipe or if you are looking for a comfort food to impress your guests check out this 4 ingredient Prime Rib! Don’t miss out on getting all of my recipes for comfort foods! 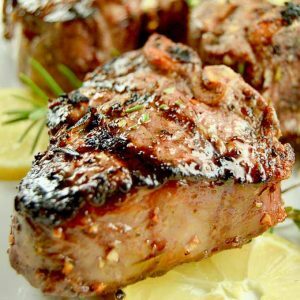 Sign up to receive recipes that any one can make that are better than you can get at a restaurant here! 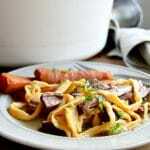 The verdict on this recipe for Beef and Sweet Potato Noodles for the company I made it for? Two of my guests asked for some leftovers to have for the next day. And a few days later I got a couple of phone calls asking for the recipe! It’s a great feeling when you know your guests enjoyed the meal so much they want to make it for themselves! There is something very comforting about this Beef and Sweet Potato Noodles that has meat that literally falls apart it's so tender. It's surrounded by homemade sweet potato noodles that absorb the some of the sauce while maintaining a firmer texture. 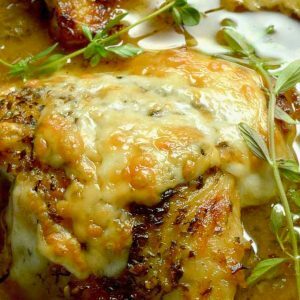 The sauce is velvety smooth and packed full of flavors from letting it simmer for a few hours to both reduce the liquid and intensify the flavors. Pat dry roast and then generously season with salt and pepper. Heat a dutch oven or heavy bottomed stock pot to high, place 1 tablespoon of olive oil in bottom of pan. Sear seasoned roast so that it is brown on all sides. Add carrots, celery, onions, garlic around the roast. Add water and bring to a boil. Once water is at a boil reduce heat to a low simmer. Cover with lid and allow to cook for 2-3 hours until meat is fork tender and it falls apart when cut into. Using a slotted spoon to remove onions, celery, garlic and carrots and discard. While beef is cooking,you will make the noodles. Beat eggs (removed from the shell) and the salt in a mixer. Add flour and sweet potatoes all at once and mix. This will be very thick. Roll out dough to 1/8" on a heavily floured board or a heavily floured piece of parchment paper. Allow to set and dry for 1 hour. You will need to flip the dough at least once during the hour of drying. Then you will cut the noodles in half 4 times and then cut strips 1/4" thick. Then take your fingers and spread the noodles out over the board/paper and let dry until it is ready to be boiled. Once the meat is fork tender and the vegetables have been removed, using a fork, pull the beef into small bite sized pieces. Bring the liquid back to a boil, add noodles and cook for 5-6 minutes. Fresh made pasta cooks faster than dried store-bought, but taste test it if you are concerned that is not enough time. Serve in a bowl with plenty of broth with beef and noodles. 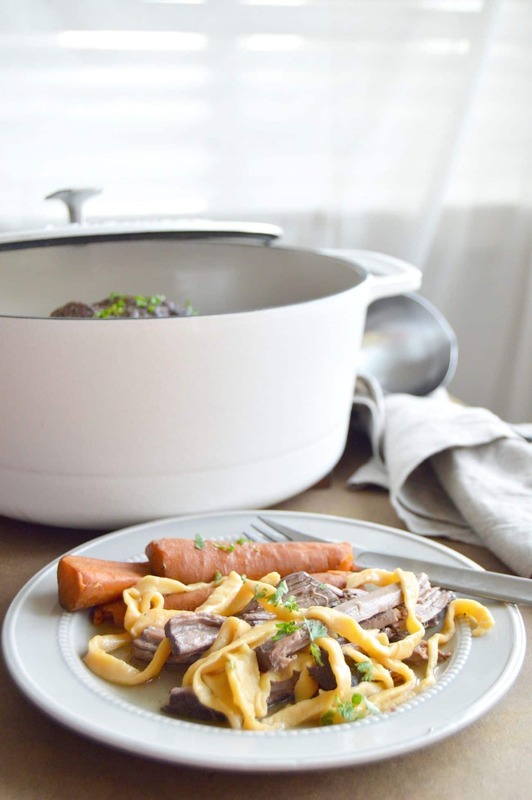 Did you see the beautiful white Dutch Oven pictured in this post? It’s from Marquette Castings. They are a company out of Michigan, USA who have really researched what makes great cast iron cooking. I loved this pan and have used it in at least 7 different recipes since getting it. The sides are straight up which means my whole roast fit in there with out being smashed in. Cast Iron heats so evenly and you can really tell when you see how your recipe comes out. Did I mention what a breeze it was to clean up? The inside is smooth so after letting the pan cool, I ran some water in it while I picked up the rest of the kitchen. I simply used soap and a sponge and it was done in minutes. I also really liked the lid. It has a screw in the center so you can balance the lid to have your food only partially covered while simmering. It’s a small thing, but it shows how much care Marquette Castings took in creating their products. Check out their website to see all of the products they are offering. **** I did get the Dutch Oven to try in my cooking with no obligation to do anything in return for it. I was so happy with their product I wanted to share how you could get their Cast Iron Products if you wished. « Chicken and Rice soup with Avocado: The Best soup when you’re sick! The sweet potato noodles were fantastic. Do you think I could use them in a vegetarian lasagne? The only noodles I make myself are zoodles and that does not count! I am going to try to make these sweet potato noodles. The dish has all the yummy ingredients I love! I can’t wait to try making the noodles! Nothing better than homemade pasta! This looks delicious and is bound to impress all your dinner guests! I have got to try making those sweet potato noodles – think this would work with a gf flour mix? And am definitely going to check out the Marquette Castings pans and kickstarter campaign! Wow! That looks like the perfect cozy fall meal. I have never made my own noodles before… time to change that! Goodness! This is comfort food for sure! It looks yummy and perfect for fall! thanks Kristine! Its always been comfort food for me because it always reminds me of my grandma! This sounds so yummy. I have never tried making noodles. You make it sound so easy! That is a great pot, too. I need one of those.! I am salivating reading this and looking at the photos! What a gorgeous recipe and a superb story to go with it! I wish your granny was my granny too!